Hope you had a great Thursday. I have spent this past week since Monday in the basement, hauling out Fall/Halloween decorations, box after box. I went through it all and decided what was coming upstairs and what was going. The bay window is full of beautiful scarecrows, leaves and lights, along with pumpkins, black cats, and sunflowers. The hutch in the dinning room is loaded with beautiful pumpkins and wonderful statues of kids trick and treating. The rest of it is going. It's amazing how much "stuff " you collect over the years. Now my next task is Christmas............that will take more than a week! Stickers and Borders by K & Co. This card just makes me laugh! I love it! got a chuckle out of this one! 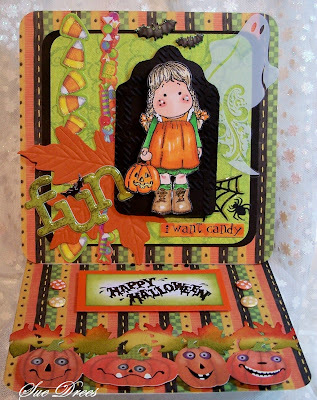 what a fabulous halloween card sue, great colours and design. Oh Sue - you're sentiment says it all - this is pure FUN! ps hop over to join us at Totally Tilda chall with this beauty..
WOW what a wonderful-happy Halloween card! Thank you so much for joining us at MDUC this week! Wow, this is such a great card! Beautiful! What a gorgeous card Sue. Love the card! 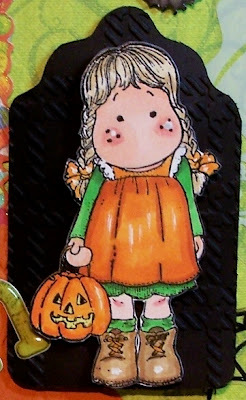 My favorite thing about fall is the colors and this card had plenty, love it! Oh she is ready for the candy all right. Great fall card. Oh, I just love all of the fun embellishments on your card!! Tilda looks lovely in her bright orange dress. All dressed up for Trick-or-Treating. Thank you for joining us on the Simon Says Stamp Challenge blog.